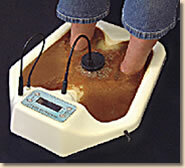 Colonic Hydrotherapy is referred to as a colon irrigation, colonics, or colon therapy. All these are names for Colonic Hydrotherapy which uses water for inner cleansing. This therapy is available at the Clarendon. We are the first clinic in the West Midlands to have offered Colonic Hydrotherapy treatments and have 20 years experience. 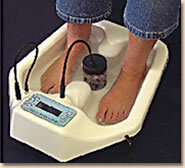 We are fully qualified and long standing members of the Association and Register of Colon Hydrotherapists. The Clarendon has a registered Colon Hydrotherapist who has been trained at one of the approved Colonic Hydrotherapy training colleges. The premises are inspected prior to their admission to the register of The Association & Register of Colon Hydrotherapists. Your first visit will involve the taking of a case history together with an explanation of the procedure and benefits of the treatment. You need take no special measures prior to your first visit. Results will be more rapidly achieved if you can follow a healthy eating programme or colon cleansing plan of a course of 3 colonics. The average healthy transit time from eating to defecation should be less than 24 hours with a bowel movement at least once a day, if not following each full meal. With disease, poor digestion, candida (yeast overgrowth), irritable bowel syndrome, chronic constipation and diarrhoea are usually accompanied by auto- intoxication, literally, 'self-poisoning' (the reabsorption of soluble wastes into the bloodstream) which places a heavy burden upon the other eliminatice organs of the body such as the kidneys, lungs and skin. Chronic constipation can also lead to further direct complications such as diverticulitis, haemorrhoids, fissures, colitis and even bowel cancer as well as chronic toxic conditions in the rest of the body such as acne and eczema. The cardio-vascular system, the nervous system and the liver are especially prone to this 'self-poisoning', and can lead to feeling heavy, dull and slow. Excellent for those suffering from headaches, bloating, weight problems, circulatory problems, skin conditions, lethargy, sleeping problems. The Platinum Detox process makes use o the body's natural functions and works by energising the water to attract positive and negative ions from both the body and the water. This process makes use of the 2000 pores in the existing membrane of the sebaceous and eccrine glands in each foot to remove by-products of excretion, which include Toxins. The treatment is painless allowing you to enjoy and be captivated by the visual effect the process creates.